Enjoy another pleasantly warm and sunny autumn day in Santorini! The humidity level remains low and the northwest wind starts falling towards the afternoon … a perfect day for activities! Perivolos - Perissa: The black beach is ideal for walking, cycling, water sports, swimming in the sea, or just … relaxing on a sun bed. 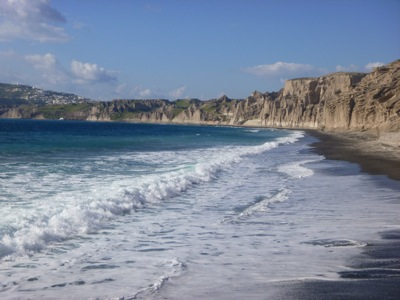 Kamari: The sea is next to one of the most touristic resorts of Santorini with many shops and hotels. Vlychada: Walk along and explore the unknown aspects of the quiet beach.